Your doctor may have recommended weight-bearing exercise, or you may have read that such exercise is essential for healthy bones. But what exactly is weight-bearing exercise and how does it help improve your health? All that said, it can be difficult for people with arthritis to stick with a regular exercise program because of their physical limitations. Consulting with your doctor and physical therapist can help you set personal goals within those limitations and understand the types of exercise and the benefits of each. Range of motion exercises: An example of the range of motion exercise is to move each of your joints through its full range of motion daily. Endurance exercises: Endurance exercises raise your heart rate and are important for improving your cardiovascular fitness. 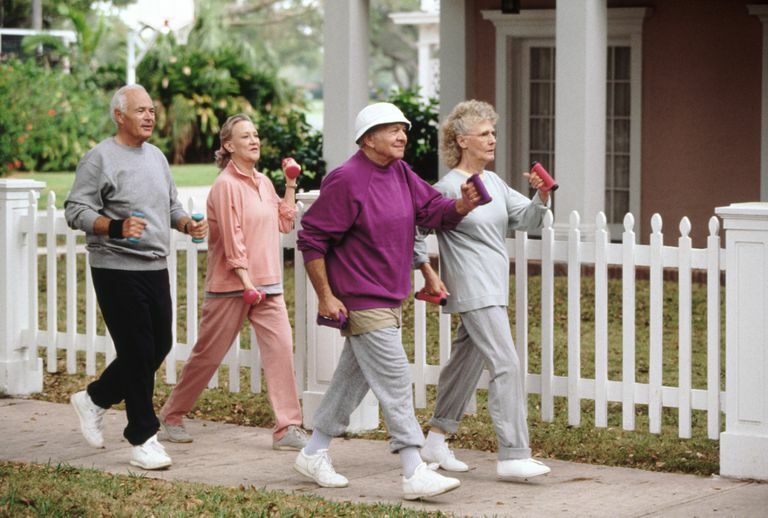 Weight-bearing exercise is essential for building and maintaining healthy bones and includes any activity you do that works your muscles and bones against gravity. During weight-bearing exercise, bone adapts to the impact of weight and the pull of muscle by building more bone cells. Consequently, the bone becomes stronger and denser. In addition to improving strength and joint mobility, weight-bearing exercise can reduce your risk of fractures as well as your risk of conditions such as osteopenia and osteoporosis. In order to sustain the strengthening associated with weight-bearing exercise, the intensity, duration, and amount of stress applied to bone should increase over time. Increasing the intensity of physical activity can be challenging for those with arthritis who have physical limitations, and it's important to find a balance between too much exercise and too little. What are Examples of Weight-bearing Exercise? Examples of exercises that are not considered weight-bearing activities include swimming and bicycling. What Else Should You Know About Weight-Bearing Exercise? Many arthritis patients with moderate-to-severe physical limitations will look at the list of weight-bearing exercises and regrettably be able to participate in only a few of the activities. Your doctor or physical therapist can help you do a little creative brainstorming as to other ways in which you can get weight-bearing exercises with your particular limitations. If you are living with arthritis, it's also important to talk to your doctor about any precautions or particular exercises which could worsen your arthritis. For those who are unable to do any weight-bearing exercise, non-weight bearing alternatives are certainly better than no exercise at all. A 2015 study found that even light intensity physical activity reduces the risk of heart disease and lessens the degree of disability in rheumatoid arthritis. Consistently engaging in some type of regular exercise is essential for people with arthritis in order to stay and feel as healthy as possible. Just as regular exercise is important in managing the disability and pain related to arthritis, other lifestyle measures can make a difference as well. The anti-inflammatory diet may improve arthritis symptoms. Many people with arthritis get inadequate sleep and taking some time to brush up on good sleep hygiene may help in more ways than one. Finally, take a moment to go through our checklist for living well with arthritis to learn about other positive lifestyle measures you can take to live your best life despite having arthritis. Bartholdy,C., Juhl, C., Christensen, R. et al. The Role of Muscle Strengthening in Exercise Therapy for Knee Osteoarthritis: A Systematic Review and Meta-Regression Analysis of Randomized Trials. Seminars in Arthritis and Rheumatism. 2017. 47(1):9-21. Fernandopulle, S., Perry, M., Manlapaz, D., and P. Javakaran. Effect of Land-Based Generic Physical Activity Interventions on Pain, Physical Function, and Physical Performance in Hip and Knee Osteoarthritis: A Systematic Review and Meta-Analysis. American Journal of Physical Medicine and Rehabilitation. 2017 March 18. (Epub ahead of print). Messier, S., Mihalko, S., Legault, C. et al. Effects of Intensive Diet and Exercise on Knee Joint Loads, Inflammation, and Clinical Outcomes Among Overweight and Obese Adults with Knee Osteoarthritis: The IDEA Randomized Clinical Trial. JAMA. 2013. 310(12):1263-73.